Stove Bright®, the leaders in High Temperature Paints, also offers a variety of maintenance and convenience products for your heating appliance. Unique products for helping you light your wood or pellets, seal your fire box, seal your vent pipe, as well as new gasket materials for your door seal. 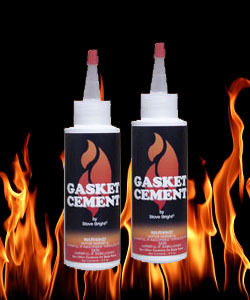 Stove Bright® Gasket Cement is a special adhesive that resists extreme temperatures generated by your heating unit. Gasket Cement will withstand temperatures in excess of 1093°C (2000°F), nearly twice the maximum temperature that wood heating stoves sometimes reach. It is formulated for just the right amount of absorption into the gasket to promote maximum adhesion to the door. Gasket cements that are too thin soak entirely into the gasket and gasket cements that are too thick have no absorption. Available in 4oz squeeze bottles with a convenient “cut to size” applicator. M230 High Temperature Sealant is a single product solution for all facets of manufacturing, installation, and maintenance applications for steel. Excellent for sealing the firebox and venting joints of gas, pellet, corn, and wood stoves. M230 is also an effective door gasket adhesive. Convenient caulking tube packaging makes for easy application. It air dries to allow painting before or after it is heat cured. Temperature resistant to 593ºC (1100ºF) peak temperatures (900ºF continuous). 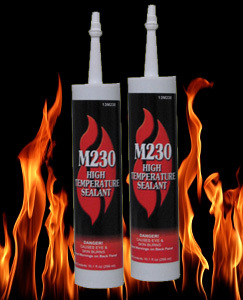 M230 is the perfect single solution as a high temperature sealant and gasket adhesive*. 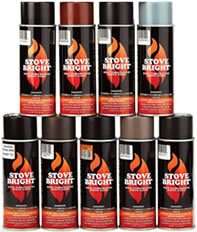 Stove Bright® RTV Silicone Sealant is a durable easy to use sealant. RTV Silicone Sealant comes in clear, red and black colours and our easy to use cartridges have special reseal nozzles making it easy to store and keep fresh for re-use.